After laughing off the ridiculous trailer of Gran Torino last year, I felt Eastwood was beginning to lose it. Then I saw it and realized I should have never criticized Clint in the first place — he is a master of achieving what he sets out to do. So this year, the trailer for Invictus hits cinemas and I find myself, once again, shaking my head. This time it’s at the overwhelming sentimentality and the flimsy accent of Freeman in the trailer. Did I assume Clint had lost it again? Yes. And now I know never to do that again – twice is enough for a lifetime and for me to doubt Mr. Eastwood’s talent is for me to doubt the laws of physics; it’s just the way the world works. 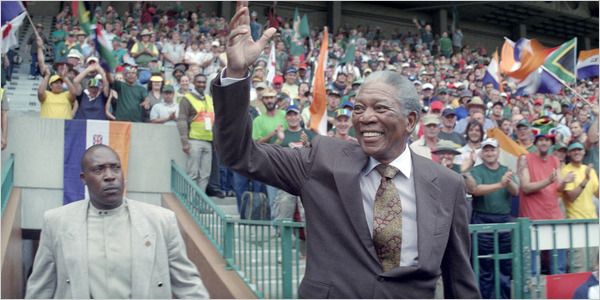 Invictus is the story of Nelson Mandela (Morgan Freeman), his release from jail and subsequently winning the South African presidential election in hopes to break down the racial barrier dividing the country. In attempting to bring unity to a nation that is literally black and white in difference, he seeks to inspire the country’s destitute rugby team to capturing the World Cup. In between his visiting with the rugby team, Mandela goes around a torn South Africa in hopes of lifting everyone’s spirit and bringing them together that way. This is cause for softly scored monologues from Mandela and more generic moments added into the pot to be stirred together by Clint Eastwood. However, this tale isn’t as trite as you’d expect. It’s a beloved sentiment when your film’s theme is “you can overcome any hurdle in life as long as you’re motivated”, and despite most people’s reaction to the ending (thinking that it’s the most crucial part of the story is flat-out wrong) it surprised me. Eastwood slows down the final rugby match to stress the exhaust these players are experiencing and it really takes its toll — well, as long as you’re invested in the story being told. The most interesting element that Invictus provides its audience with is a subplot that focuses on the bodyguards of Nelson Mandela. It shows not only the internal struggle faced for Mandela to get what he wanted accomplished, but gives insight into what life on the streets were like between black people and white people. With the inception of the last administrations employees into that of Mandela’s own. From spiteful conversations evolving into warming friendships, the script most succeeds here in creating a truly human mood. Some stretches of Mandela in his daily routine may be lethargic, but whenever this group of men are the focus you’re in for a treat. You know you’ve scripted a story meticulously when a man ignorant to a sport becomes excited when he learns that his home team has won; the bond these men share is a beautiful concoction. In the briefly divulged into story of the Rugby team that Mandela invests all his marbles in, Francois Pienaar (Matt Damon) leads his dismal team to a string of victories after falling prey to just about every team in the league. There is some nice dialogue and tension created the locker room whenever he and his team are the focus — I was especially enticed when he forces his team to drink a rotten beverage after yet another loss, topping the scene off by with a guttural toast. So while the story has been assembled with the same formula and theme time and time again, it’s the dialogue that keeps this feature a high quality affair. Tack on some nice performances to accompany it and you’ve got an inoffensive, but extremely inspiring story that touches on every base without meandering. As per usual with Eastwood, this film is polished off to an extremity. Everything is concisely composed, witty without being condescending and above all, honest. He builds the story up so well that no matter what the conclusion of the final Rugby game is, the story remains as invigorating and powerful. There is nothing left to chance when he helms a feature; an ending is simply an ending to the story and doesn’t hold too much weight on the feature. He distributes the purpose evenly throughout which keeps the 133 minutes moving at a solid pace, which would find difficult if one wasn’t a fan of Rugby in the first place, but he idolizes the sport so well that you can’t help but be intrigued in the outcomes. All in all, the story is exactly what you’d expect it to me. Warming, informative, purposeful in how it relates to current world affairs and in a way inspiring. So while the film is by no means perfect as it has moments where it dips in and out of preciseness — not unlike Freeman’s portrayal of Mandela which is made up of an inconsistent accent and powerful monologues — the general stability of it all allows for the feature to be told both entertainingly and with soul. Invictus is one of the more captivating inspirational stories to come out in recent memory. It takes a long time to travel from point A to point B, but the trip is enjoyable and reassuring nonetheless. Give me this over The Blind Side any day of the week.